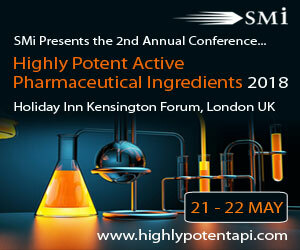 SMi are delighted to present the 2nd annual Highly Potent Active Pharmaceutical Ingredients (HPAPI) conference being held at Holiday Inn, Kensington Forum, London, on the 21st – 22nd May 2018. Our global panel of speakers will strengthen your knowledge in key topics such as risk assessment, manufacturing in early development, containment and handling issues, waste management, conceptual designs, regulation aspects and the use antibody drug conjugates. It is important to understand how containing complex production equipment is conducted and trialed, starting from the design process for flexible handling. When involving highly potent APIs in drug development, there are many facets of consideration to take into account. In terms of routes of containment, an awareness of the target of containment is needed. This will have an impact on, not only whether a specialised facility is needed or not, but also on the integral design features of the facility.